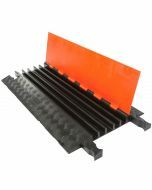 FastLane Drop Over Protectors are made from durable polyurethane and feature heavy duty "L" shape connectors for easily attaching additional protectors as required. 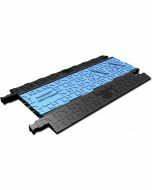 Patented 5-bar tread plate surface provides maximum traction for pedestrian traffic. These low profile protectors are compact for easy setup, disassembly, and storage. Optional Anti-Slip Rubber Pad Kit and/or Optional Carpet Kit with Velcro Fasteners also available for added traction. 2.25" x 11.25" x 41"